Mou Hitotsu no Mirai wo. 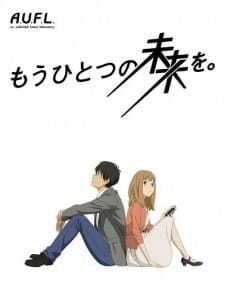 is a short created by Production I.G. It is about time travel, time communication and a very nice message. Story, 6/10 - There isn't much of one. This Anime is more about the message. Additionally, it achieves that message without a plot. Art and Animation, 6/10 - Good. Addictive. Unique compared to I.G. 's other works. It wasn't anything amazing but the scenes with the blue haired girl were really nice. Sound, 6/10 - Voice acting is nothing special. However, the sound effects and OST were amazing and even made some scenes emotional and intense. Character, 5/10 - Again, we don't learn much. It's rather about what they do than who they are. Enjoyment, 7/10 - I enjoyed this a lot for what it was. It good have done great things if only just a little longer. Overall, 7/10 - I liked it a lot. I found this Anime to be wonderful and would recommend it to others seeking a short but fun Anime. It left me thinking about the future a lot. A similar Anime I would recommend would be Steins;Gate because it takes time travel and communications further in a good way.